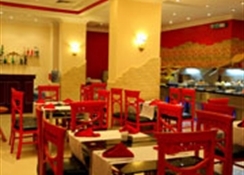 The resort has a variety of restaurants (3) and bars (4) which fulfill different tastes. The hotel offers Super All Inclusive 24 hours including Wi-Fi in public areas, daily animation programmes for adults and children, disco club, sauna, Jacuzzi, billiard, air hockey, baby foot & table tennis, water pipe. Hotel facilities: sandy private beach, heated swimming pool with a kiddy pool, Jacuzzi, sauna, panoramic roof, kids club, mini Zoo, children’s playground, water sports, Aquapark, table tennis, billiard, football field and volleyball ground. Safety deposit boxes free of charge at the Reception. There is a clinic and a pharmacy. The doctor is available 24 hours. On the hotel area there is diving center, aqua center, shops, hairdresser saloon, internet café. Hotel is with cozy atmosphere and personalized service, multilingual personnel. Egyptian red, white and rose table wines are offered complimentary at all main and a-la-carte restaurants and bars. Imported wines, various foreign brand wines, champagne and other alcohol drinks are served at all main and a la carte restaurants and bars for a fee. OASIS CAFÉ is located at the entrance area of the hotel. This café will immediately involve you into the historical atmosphere of Ancient Egypt: pharaonic design, miniature of the famous architectural masterpieces of Egypt along with immaculate service & local hospitality will not leave you indifferent to the place! Drinks, meals, billiard, water pipe, evening entertainment (extra charge). 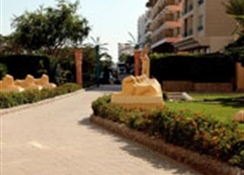 The hotel offers the guests some entertainment parties for extra charge to vary guests’ leisure such as Sea Food Party which is served on a romantic Love Boat with fantastic sea vie and delicious gifts of Red sea. Barbeque Party with African show program is on the Shisha corner which is located in ISIS bar and restaurant on the territory of King Tut. Search of the Gold Party will offer the guests live band music, snacks buffet and disco on an outdoor terrace of Sunset Bar with panoramic view on Red sea. 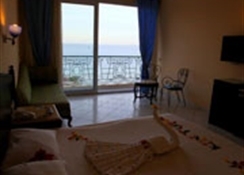 The hotel is ideally located on the Red Sea shore with magnificent view of premier dive site and a beautiful coral reef with a direct access to the beach. The hotel has middle location between the city center (Sakkala) and downtown. The resort offers its 135 spacious rooms including Family rooms (accommodation 2 adults and 3 kids), 2 suites, connected rooms, bungalows with private terrace on the beach. All rooms are with balconies, individually controlled air-conditioning, mini fridge, telephone, hairdryer, satellite TV, tea & coffee making facilities.